It's been a month of many colours. Hyacinth blue for Janet Stuart, and pale pastels for a gentle handover of authority; bold, vibrant hues for this month's saints Mary Magdalen and Ignatius, and an iridescent rainbow of colours for all the meetings with my RSCJ sisters, especially my Society "twin" right at the beginning of the month. And all this under the burning red-gold of a blazing summer sun! 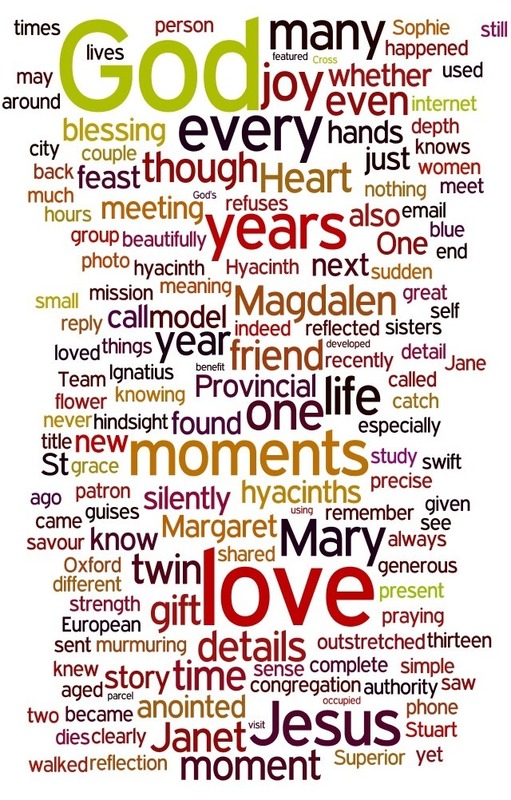 In my July Wordle twin shared gift love, which is definitely how it was when we met, two became anointed, which is pretty much what happened at our handover, and lives are enfolded in God, which is very much what happens all the time, whether seen or not. My favourite, though, is hindsight found new grace moments - because that's what hindsight and reflection enable us to do. A really beautiful one this month! If you squint sideways a bit you can see "Love sent murmuring details" - I like that! I look forward to August's Wordle.